An achingly funny story about how to be your own hero when life pulls the rug out from under your feet. 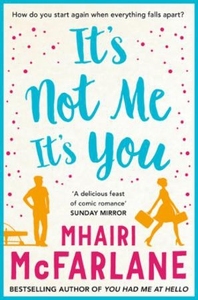 From the author of the bestselling YOU HAD ME AT HELLO Delia Moss isn't quite sure where she went wrong. When she proposed and discovered her boyfriend was sleeping with someone else - she thought it was her fault. When she realised life would never be the same again - she thought it was her fault. And when he wanted her back like nothing had changed - Delia started to wonder if perhaps she was not to blame... From Newcastle to London and back again, with dodgy jobs, eccentric bosses and annoyingly handsome journalists thrown in, Delia must find out where her old self went - and if she can ever get her back.